There is a new MP out and it is Windows Server File and iSCSI Services 2012 R2. Besides the support for Windows Server 2012 R2 this management pack adds monitoring for Work Folders. You can download the MP and its guide from here. The last issue I’ve stumbled upon with System Center is with VMM component. You receive the following error: Error (13924) The highly available virtual machine (VMNAME) is not supported by VMM because the virtual machine uses non-clustered storage. 1. Make sure you’ve added your file server in VMM by FQDN. If it is not added by FQDN you have to add it. 2. Create new share. You can create it on the same server. Give the share appropriate permissions. 3. 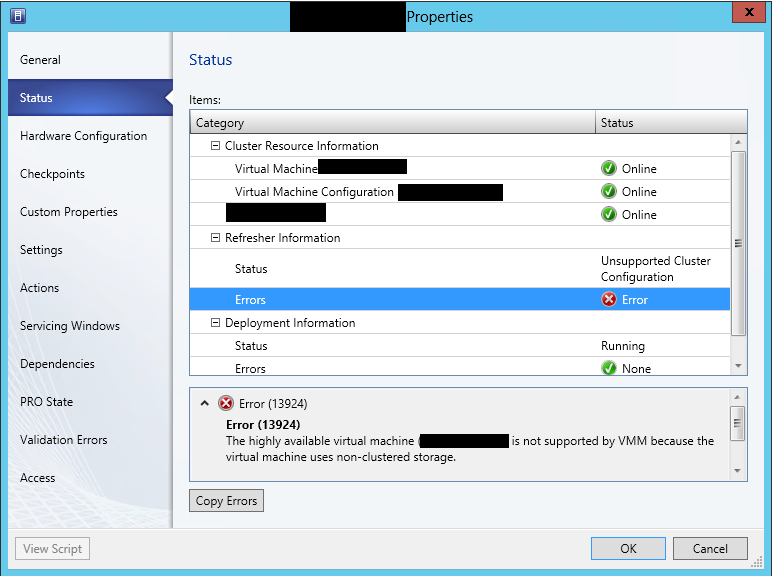 Locate the new share in VMM. Add it as storage location to your hosts/clusters. 4. After is added make sure it show green in the properties of the hosts/clusters. 5. Storage migrate all your virtual machines from the old share to new share. For the machines with status Unsupported Cluster Configuration you can change the status to Running by live migrating them trough the Failover Cluster console. 6. After storage migration of each virtual machine refresh it and make sure in the properties of the machine in Status tab all is green. 7. After successful migration of all virtual machines you can remove the old share from the hosts/clusters and delete it from the File Server. I’ve also may had problems with the permissions on the old share but it is easier to create new share than fixing permissions on existing share with running virtual machines. The information is provided ‘AS IS’ with no warranties and confers no rights. Keep in mind that your case may be similar and this solution may not work for you. This Jump Start Training was held live last month and now it is available as a recordings. This course is led by Microsoft Senior Technical Evangelist Rick Claus and Ed Liberman from TrainSignal. The course is divided in 12 topics which can be found as separate videos here.